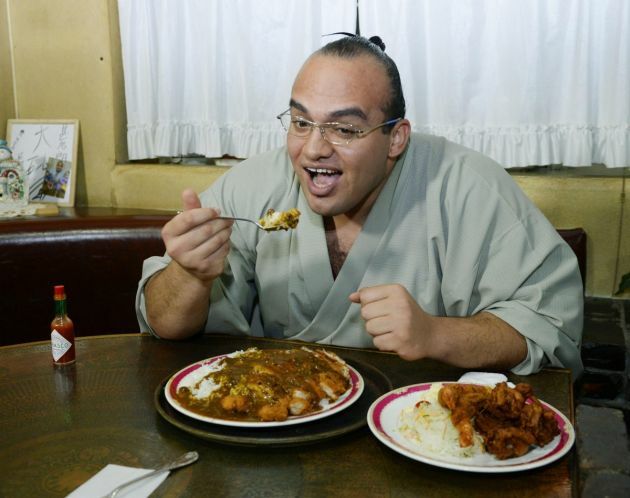 (Photo: REUTERS / Kyodo)Egyptian sumo wrestler Osunaarashi, real name Abdelrahman Shalan, breaks his Ramadan fast with curry and rice with chicken cutlets in Inazawa, Aichi Prefecture, on the evening of June 30, 2014, in this photo taken by Kyodo. Osunaarashi, 22, is the first Egyptian, first African, first Arab and first Muslim to muscle his way into sumo's professional ranks, so proud of his heritage that he observed the Ramadan fast during a just-ended tournament. Japanese tourism officials are shifting gears as they try to think of ways and means to accommodate the growing number of Muslim tourists in the country. Analysts say that Japan is courting the Muslim tourists primarily in its quest for 20 million foreign visitors by the time of the 2020 Olympic Games which Tokyo is hosting. The Global Muslim Lifestyle Travel Market 2012 report cites the Muslim travel segment accounting for US$126.1 billion in outbound expenditure in 2011. It is expected to hit US$192 billion, or 13.4 per cent of global tourism expenditure, by 2020, The Associated Press reported. The largest number of Muslim tourists came from Malaysia and Indonesia. Malaysia had 158,500 visitors in the first nine months of 2014, a 52.3 percent increase, and Indonesia had a 13.4 percent increase to 111,400 visitors. Beginning in 2013, visa exemptions made it easier for Malaysians to visit Japan, and exemptions for Indonesians are due to start on December. Muslims pray five times a day and prayer rooms are important for them. That's why more and more establishments in Japan are now providing prayer rooms. Major airports are now equipped with prayer rooms and Takashimaya, a popular department store in Tokyo recently opened a prayer room due to many Southeast Asian tourists looking for one. Company spokesman Mikio Koda told AFP that the prayer room is equipped with a wash area and an arrow pointing in the direction of Mecca. Halal-food that is allowed and prepared according to the Islamic dietary guideline- is now also being introduced in many dining areas. Restaurants are now encouraged to introduce halal versions of traditional Japanese fare like tempura and even whale meat. Local businesses have also been mindful of Muslim food restrictions like pork and alcohol. According to CNBC, Japan's interest in the Muslim tourists has also started local businesses. One is "Halalminds," a mobile phone app that seeks to help Muslims find halal products in Japan. Indonesian native Agung Pambudi designed the app to help Muslim tourists in Japan. He spent $3,000 designing it and it has been downloaded 4,000 times since it launched four months ago. Travel agencies like the Feel Japan with K has also started Muslim-only tours in recent years to tap into the growing market.